A drop-down menu ensures your site is unique and stylish yet easy to use. The ability to have multi-levelled menus allows your visitors to smoothly navigate around your site, moving from page to page with just one click of your menu bar. Additionally, for those who have a large amount of site content or many pages in your menu it gives you complete control over how to group your pages, creating a more organised website page structure. A Main Menu is the page at the top of your site that give your users access to the main pages. For example, the “Blog” page or “About Us” page shown below. A Sub-Menu is the page displayed beneath your Main Menu. For example, the “Meet the Team” sub menu seen under the “About Us” menu shown below. A Sub-Page is a page that can be accessed from your Sub-Menu. For example, the “Ian” page is accessed through the “Meet the Team Page” Sub-Menu. Your “Site Content” screen is the main area you will use to manage your drop-down menus. 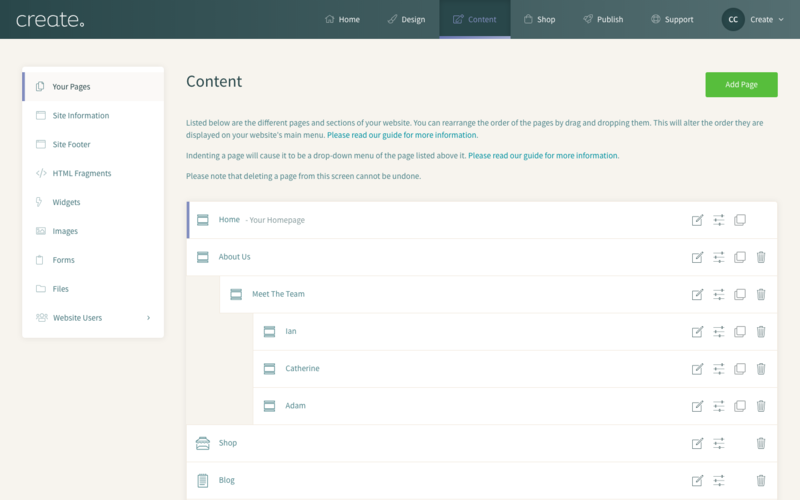 Here you can easily set your site structure by dragging and dropping your pages into the order you want. You can also set up your Sub-Menus by dropping your pages into the grey Drop Zones that appear below your Main Menu page. If you would like to set up Sub-Pages you can then drop them into the grey Drop Zones that appear to the right below your Sub-Menu. When your pages are dropped your “Site Content” screen will automatically save your menu order, ready for next time. Lastly, if you have a page you would like to direct your visitor to but do not want to display it on the Main Menu you can hide your pages. 1. Go to your "Content" Screen on the Top Menu. 2. Select "Page Options" next to your page. 3. Change the "Shown on Menu" drop-down list to "NO". These hidden pages will now display as greyed out on your Site Content Screen and can still be reordered using the drag and drop functionality. On the “General” tab change the “Shown on Menu” option to “YES”. Also change the “Show Categories in a drop-down Sub-Menu” option to “NO”. Next, go to your “Shop” screen . Select “Shop Settings” from the left-hand menu. Change “Show Categories on Main Menu” to “Do not display”. Select the “Page Options” icon next to your “Shop” page. Also change the “Show Categories in a drop-down Sub-Menu” option to “YES”. Next, go to your “Shop” screen. Change the “Show Categories in a drop-down Sub-Menu” option to “NO”. Change “Show Categories on Main Menu” to “Display as Main Menu Items with drop-down Sub-Categories”. On the “General” tab change the “Shown on Menu” option to “NO”. Change “Show Categories on Main Menu” to “Display as Main Menu Items”.